/ ULR ​50BMG - What Recoil? ULR ​50BMG - What Recoil? Three things generally come to mind when someone says “50BMG”. When we were developing the Noreen Ultra Long Range rifle, or “ULR” for short, those three items are what we focused on. The firepower and long range capabilities are both covered with the 50BMG chambering...but the large cartridge brings us to item number 3: recoil. The 50 BMG has a big, bad cartridge pushing muzzle energy in the neighborhood of 13,000 ft. lbs. Needless to say, with energy like that, the gun can create a pretty nasty “kick” when firing. The recoil was our biggest hurdle when designing this rifle. We wanted to make a 50BMG that was not only incredibly accurate, but that wouldn’t leave the shooter bruised and sore at the end of the day. Increasing bulk and creating a heavier firearm is the easiest way to reduce felt recoil. Starting with the heavy chromoly bull barrel, we designed the rest of the chassis to help keep the weight balanced. The position of our rugged, built-in bipod makes the 32 lb. rifle incredibly manageable. A combination of heat treated steel and billet aluminum has been perfectly designed to balance the rifle, making aiming and positioning a breeze. The muzzle brake on the ULR went through several renditions before we settled on a final design. Balance was key. Most brakes are a combination of either ports perpendicular to the barrel, rear facing ports, or both. The weight of our rifle does a great job of cutting back on muzzle rise, so our focus was only on recoil. We kept all ports on the sides of the brake. The final design utilizes three fins, that redirect the muzzle blast approximately 33 degrees in a rear facing direction and greatly reduces the felt recoil. We took recoil reduction a step further with a proprietary stock design. The Noreen Suspension Stock. The stock was the final piece of the puzzle in the design. It’s stiff, and solid, so it doesn’t move or reposition itself during firing. The spring suspension system also compresses about a ½ in. during firing, which turns the “kick” into a “push”. 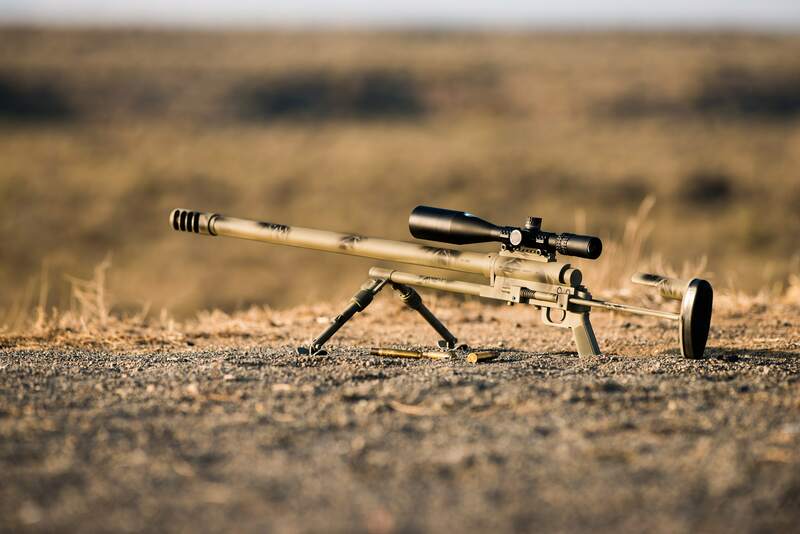 When it’s all said and done, we were able to develop a rifle that is accurate, has some serious firepower, and manageable recoil that makes this 50BMG an all day shooter. If you have any questions, feel free to contact us, or you can find more information about the Noreen ULR here.